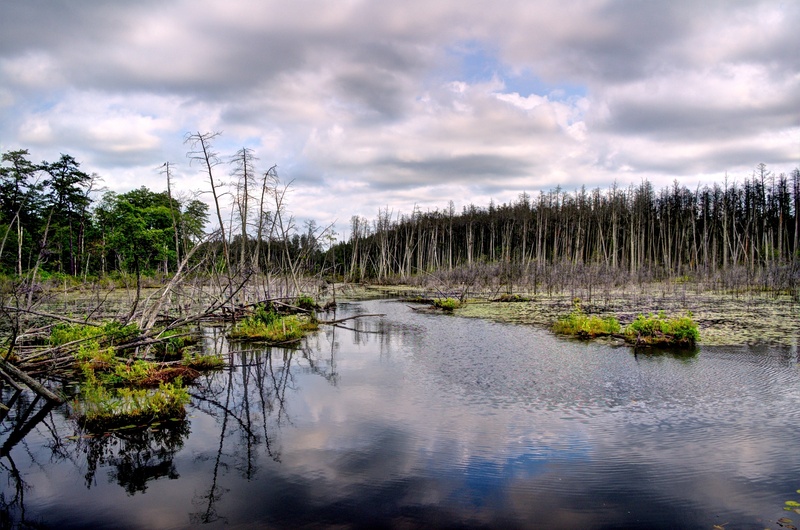 The Pine Barrens… One Click Away! 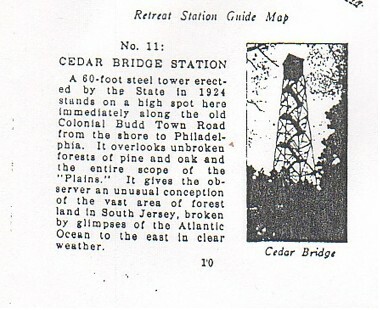 In 1924 records show that the first Cedar Bridge fire lookout (60 foot Aermoter) was erected on a small knoll near the Cedar Bridge Hotel on the old Cedar Bridge Barnegat Road. If you have read More Forgotten Towns by Henry Beck you may remember he visited the location in the mid 1930’s, and mentions it in the “Refugees At Cedar Bridge” chapter. Very near the time Beck visited the site the Coast and Geodetic Survey designated the fire lookout there as a “geodetic survey location” and added it into their records. In 1950 it was visited again and the tower was gone. The person visiting then took the time to check the State Forestry Department records and found it had been “torn down” in 1938. STILL EXISTS IN GOOD CONDITION. A 1951 visit mentions it was found to have been moved across the county line to Burlington County in 1938. THE COUNTY LINE IN BURLINGTON COUNTY. So we now know that in 1938 is was gone from it original location and in Burlington County, but where? We only need to go on a tour to find out. In 1939 a “Tour Guide” was published called “The American Guide Series” which describes traveling what is now Route 72 from Manahawkin to Route 70. It was designated tour #35. Points of interest along the route were pointed out for the traveler if they wanted to stop and visit locations mentioned along the route. The tour started at the shore in Ship Bottom where unbelievably the population was noted as 277. From there the tour headed west pointing out points of interests. When the tour reached the turnoff on 72 that would take one to the above mentioned Cedar Bridge tower, they described it like this. “Left on this road to Cedar Bridge Lookout, 0.8 (Mile). (open), a 60-foot tower with men on 24-hour duty. From the observation platform is a sweeping view of the forest”. The problem is as we now know, the tour was published in 1939 and the tower was torn down in 1938. If they had traveled up that road they would have found the tower gone. It had been moved across the county line to Burlington County in 1938 as mentioned above. The tour continues west on 72, and at Coyle Field just over the county line in Burlington County they encountered the now moved Cedar Bridge tower at it second location, on the top of the knoll, on the north side near the road, across from what then was the National Guard Airport and now Coyle Field. “At 18.8 (miles)., on a cleared knoll close to the road, is another fire lookout. An excellent view of the long stretch of the Jersey pine belt is available from the platform, reached by steel stairs. Even from the road there is a broad vista of miles of wasteland, covered with scrub oaks and stunted pines barely waist-high. The stubby growth is like a coarse lawn as it sweeps away to become a distant blue-green sea. A few straggling trees rise above the mass, emphasizing the lonely scene”. Remember, this was 1939. Lookout historian Bob Spear in his unpublished manuscript describes what happened next. The reason it was moved is not known by me, but there may be a clue mentioned above as to why. Coyle Field which was the National Guard airport was designated as a reserve landing area for bombers and other aircraft out of Atlantic City during the war. Landing a military plane on an airfield with a fire lookout so close most certainly was a hazard. So the Cedar Bridge tower “designation” with a new tower mentioned above moved on to a lonely spot on a sand road leading from 539 to the Forked River mountains. It’s third location was in place. The 110′ International Derrick lookout had a unique flat roof with a railing attached so that it could be used to watch for enemy planes during the war. There was a trap door in the top for entering and leaving the roof. There was no other tower like it in NJ. Unfortunately, this tower had no electricity and was so remote it was being vandalized during the 70’s and very early 80’s so it was decided that it needed to be moved. 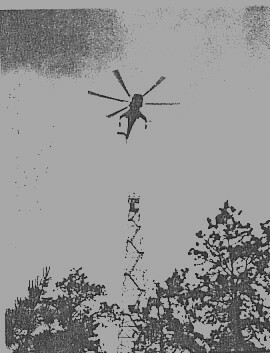 Around 1983 a Sikorsky helicopter took the tower on it’s one mile journey to it’s 4th and as of now last move to it’s present location along 539. During this move the unusual gable roof was removed and one 10′ section of the tower was damaged. It now is 100′ tall. Originally published in the New York Tribune, August 6, 1893. You may still call it, as of old, the province of Camden and Amboy; the realm of the Duke of Gloster; or yet you may resuscitate the antique joke about it’s being a foreign land out of the Union. Under any of these names the southern part of New Jersey still remains, in great measure, an unknown land. There is, it is true, outposts of exploration at Lakewood. Hardy fisherman, well armed with bottled bait, have skirted the coast and made landings here and there. There is, moreover, a well marked “trek” straight through the wilderness from Philadelphia to Atlantic City, and another to Cape May. There are prosperous towns and cities, too, well-known to fame: Millville and Bridgeton and Vineland and Hammonton and others. But if the great expensive territory that makes a southern half of the state, what man has knowledge? What ideas conveyed to a New Yorkers mind by such names as Lower Bank, or Tulpehocken, or Martha’s Furnace, or Repaupo, or Blue Anchor? Now and then an item appears in the papers, as several times in the last few weeks, about forest fires in New Jersey. We hear fires and burn thousands of acres, that rage for many miles, and that threaten and sometimes sweep away whole villages, and one wonders that such things can be, so close to the metropolis. It is true that right here, between New York and Philadelphia, lie many hundreds of miles of wilderness, almost as free from civilizing touch as a wildest parts of the wild West. From the car window of the railroad train one looks hour after hour at a panorama of almost utter desolation. Meeting the sky on every hand spreads an almost level expanse of stunted woodland, dark green and gray. Much of it reaches in height scarce to the windowsill; but here and there arises to goodly forest standards. The ground, as you see it near the track, where not covered thickly with leaves, is snowy white, the wake of bleached and glittering beach sand. Where the road run through a cut you see that this white sand is one, two, sometimes three feet deep, gradually blending into a pale yellow mixture of sand and loam and gravel. For miles the woodland is absolutely unbroken. Then you come to a narrow wagon road winding through, gleaming white as the wake of a steamboat. Again you pass unpainted pine cabin with a small clear field about it, in the white soil which some stunted corn and a few hills of sweet potatoes are growing. Often the eye is gladdened by the sight of a brook or river of the clearest imaginable water flowing over a bed of sand, perhaps white, perhaps ruddy with iron ore. For all this dreary wilderness is well watered by perfect network of unfailing streams. And then you ride for other miles through ashes and blackness, where forest fires have raged, licking up all before them save the charred trunks of the larger trees. … the barrens produce little else but scrub oaks and yellow pines. These sandy lands yield an immense quantity of bog iron ore, which is worked up to great advantage in the ironworks in these counties.” This iron industry is now a thing of the past, but it is left it’s mark upon the country. What is now Lakewood was originally a great center of iron manufacture, and other settlements, the names of which are compounded with Forge or Furnace, bear witness to the same former fact. Other industries, however, have here and there sprung up to take its place. In one district the sand is well fitted for making glass; in another clay beds make possible great potteries; in the third the culture of small fruits is profitably pursued; and lumbering and charcoal burning are widespread industries. Yet it remains true that a vast proportion of this area is still an unimproved wilderness. Pine Barrens the land is called. It is not, however, wholly covered with pine. Perhaps nearly half the trees are oaks. There are bound for kinds of oak and four conifers. The former are the Q. prinoides or dwarf chestnut oak, Q. prinus; blackjack, Q. nigra; the black scrub oak, Q. ilicifolia; and Spanish oak, Q. falcata. The conifers are the Jersey or scrub pine, P. inops; here and there the pitch pine, P. rigida; occasionally the handsome and stately yellow pine, P. mitis; and the juniper or red cedar, with is by no means common. Besides these one finds the rex or American holly, growing almost to treelike size, and everywhere the bushes of huckleberry and bilberry. The vast bulk of arboreal vegetation belongs, therefore, to the pine, oak and heath families, and the last named family is most widely represented of all. These are three huckleberries, Gaylussacia dumosa, frondosa, and resinosa, and three bilberries of the cranberry tribe, Vaccinium Pennsylvanicum, vacillans and corymbosum, all called huckleberries: besides the two true cranberries, V. oxycoccus and macrocarpon. Then there are the aromatic wintergreen, the trailing arbutus, the kalmia or American laurel, the rhododendron, the azalea, the sand myrtle, and various others, a full dozen of the heath family; so that it is not inappropriate to dream of some resemblance between these gray green plains and the heather-clad moors of the old country. It is evident, then, that such a country, despite its desolation, cannot be altogether unbeautiful, nor destitute of value. Perhaps if some of the fierce and persistent energy that has been expended in the far West had found its object here, this wilderness might now be blossoming as the rose, and the New Yorker might regard with a practical interest apart from fishing, gunning, and deer-chasing. There is scarcely a spot that does not betray some beauty to the observing visitor and offer some promise of development. Especially is such the case along and near the watercourses and lakes, which everywhere abound. These are in the pine barren country but no region this side of the tropics to be less barren or more luxuriantly clad with worthy vegetation. One stream, familiar through the virtue of one hundred unhurried visits, may be taken as a type of all. It’s navigable course is not long in proportion to its volume; a couple of miles at most. Where one enters it from the lake into which it empties it is a dozen yards wide and a dozen feet deep. And at that death you can see not only the pebbles, but the very sand grains at the bottom, and almost count the scales on the pike that float below you half hidden in the waving grasses. Three feet from the shore it is as deep as in midstream, and from the waters edge to the cypress and arborvitae — both called cedar here — rise sheer, a dark green, moss-hung hedge, twice as high as the stream is wide, and so dense that it shuts out the light of the declining sun as utterly as would a wall of stone. For that hedge is not only dense with clustered needles and heavy festoons of moss at the margin of the stream. It is itself only the margin of an unbroken forest of noble cypresses, extending perhaps for miles. And now and then, as you float along on the crystal current, you catch through random hedge-rifts vistas of dim aisles and clustered pillar-courts, where the great gray shafts rise fifty feet without a branch or twig, straight as a Doric column. From the lofty roof hang mossy banners and streamers of green and gray and silver, while here and there like graceful candelabra, stand laurel magnolias, with blossoms whiter than the purest wax and sweeter than the perfume of cathedral incense. The very stream itself has now become an aisle, with crystal pavement, for the cypress branches meet and intermingle far above your head, and only let through here and there a shattered sunbeam at noonday, to make aerial mosaics on the liquid floor. From bank to bank is little more than a strongman’s leap. You can no longer wield your oars as oars, but only as paddles. But with the same oars you vainly try to fathom the depths below, where silvery grasses wave and quartz pebbles glitter like snow, or glow blood red with the iron that impregnates these sands. Nor does the scene lack the minor accessories of decorative art. Here and there are floating in the waxen blossoms of the sweet-scented water lily, now all purest white, now with the outer petals tinged with pink, and now, very rarely, with all the petals blushing like a rose. Every foot of the bank is friends with pitcher plants, or monkey cup, or side-saddle flowers, which ever you may call the purple sarracenia, their leaves ranging from an inch to six or eight inches in height, and from the palest golden green to deep crimson and dusky purple in hue. Here, too, the heath family abounds, chiefly represented by the aromatic wintergreen (Gaultheria) here called teaberry, and praised for both fruit and leaves; by the gaylussacia, or true huckleberry, with it’s racemes of glossy black berries – rarely snow-white; by two of the vaccinium, the oxycoccus, or cranberry and the cyanococcus, or blueberry, here, as elsewhere, not distinguished from the huckleberry; by the umbellata, or prince’s pine, which seems to defy the moisture and to flourish in the swamp as well as in the uplands; by the kalmia, or pale laurel; by the white and purple azaleas, and by the rhododendron, or great laurel; and if you look aright you will find in the drier spots the spicy epigaea, or trailing arbutus, which one calls mayflower and another maypink, and elsewhere shrubs of fragrant clethra, and yet again, in some dense shade, the waxen bells of indian pipe. Indeed, the heath tribe seems, as on the upland barrens, to outnumber all others, and to vie for dominance even with the overshadowing conifers. Such are the principal flora of this wilderness. The fauna are not less interesting, the less evident. But there are pikes and pickerel, and golden perch, and the forbiddingly looking but loathsome catfish, abundant in the grassy depths. If you are quiet of manner and quick of eyes, you may now and then see a wood duck, glide from shade to shade like the fugitive ray shop from a prism, and in season you may shoot, if you can duck, teal, brant and goose, as they fly seaward to the tidal meadows. Kingfishers, blazing with emerald and ruby dart about; hummingbirds rival in dainty grace the flowers they hover over, and hawks and now and then an osprey or an eagle glide above all with ominous calm. There is something more than beauty, however, in such a region. There is much of commonplace, practical value. The timber, of course, is evident. Few soft woods are more valuable for building purposes than this cypress and arborvitae, so light, so strong, so workable and so durable are they; and even sticks of only six inches thickness have their commercial worth. So many of the swamps are already cleared, or partially cleared, and now present only a bald sun scorched expanse of hapless underbrush, through which the diminished stream winds a dreary way. Through others forest fires have swept, leaving behind leafless branches and blackened trunks. It is difficult to determine which more destroys the beauty of the place and makes the scene more dismal – axe or flame. Yet neither altogether robs the swamp of value. Perhaps its greatest wealth is still remaining. For if you leave your boat and force your path through the weeds afoot you will find it needful carefully to pick your way. Most of the ground seems quagmire. It yields to the pressure of the foot, and ere you are aware you will sink knee deep. Now, take your fishing-pole and thrust it downward. At three feet deep it strikes bottom. Try again, here, and it goes six feet without a check. Once more, here; and ten, twelve, fifteen feet, down it goes. What is it piercing? Nothing but muck, soil, black muck, the rotted vegetation of uncounted years. What if one should dig it out, cart it away, and spread it thickly upon the sandy, barren soil of the dry uplands? He would not need to plough it under; in that light soil a heavy wheelbarrow would do the work. Then he might plant what he would, and get a harvest of such abundance as a Western prairie might envy. It is worth ten times the weight of the fish and mussels that the farmers near the bayshore spread upon their fields. It has a possibility for production almost beyond estimate. Yet there it lies, neglected and ignored, while men say their sandy farms are well nigh worthless. The stream flows into a small lake, of which the shores are bordered with acres of fragrant water-lilies. At the farther end from the stream the lake is bounded by a half natural, half artificial dam, through a gateway in which the water flows to turn a mill-wheel, and then to fall into a brackish tidal creek, that winds sluggishly across many miles of salt meadows, clad with coarse grass, and flaunting red and white rose-mallows, and green and crimson samphire, to the bay. The top of the dam is a roadway, hedged at the meadow, with a row of hedge willows, and here and there a maple. If you wander through the streets of the sleepy village you will find them densely shaded by great white willows, 50 to 70 feet high, with trunks two or three feet thick, and branches mingling over the broad roadway. Indeed you will scarcely find elsewhere, unless in some favored quarter of New England, villages surpassing in beauty some of those along the New Jersey shore. One might almost say that “on a narrow strip of land, ‘twixt two unbounded seas they stand.” For on one side the sand plains, and on the other the marshes and the sea. But on this narrow strip are charming villages, and farms that are by no means unfertile. It cannot be denied that a sort of social and industrial stagnation prevails. “The place is dead,” the villages themselves will tell you. Farming yields little profit; the oyster beads and fisheries of the great lagoon they call the bay are less productive than in former years, and the coasting trade in sloops and schooners that once flourished and made each village a busy mart of commerce, has become a thing of the past. Young man of enterprise leave home to seek a fortune elsewhere, while those who stay eke out a scanty livelihood fishing and gunning for the markets, or catering on hand or water to the wants of the big summer hotels that have been built at various points along the beach. Perhaps some day, in some effective fashion, they will turn their attention from the salt sea of the east to the sandy sea at the west, and make it something more than the home of the huckleberry, the land of scrub timber, and the playground of forest fires. In one of the worst forest fires in the history of Burlington and Ocean counties, the past four days, burning over more than 20,000 acres, five men lost their lives and many others were injured. The area involved includes the section from Chatsworth to Tuckerton. There also were fires east of Brown’s Mills. Colonel Leonidas J. Coyle, state fire warden, reported last night that the fire was under control and practically extinguished, when a change of wind turned the flames back over the area already burned over. The dead are: Edward F. Sullivan, 19, of New Brunswick. Kingsley White, 38, of Whitesville. Stanley Carr, 23, of Farmingdale. John LaSalle, 20, of New Brunswick. State Forest Ranger Ira Morey, 35, of West Creek. Sullivan, Carr and LaSalle were members of the CCC camp at Bass River. White was a member of the Whitesville fire department. Morey, a brother of Alfred Morey, fire warden, of West Creek, died of burns in hospital. With the other four and the ten injured, he was a member of a crew being rushed to safety in a truck after more than 100 men had been trapped by their own backfires in the Stafford’s Forge section. Carr was the driver of one truck carrying 50 of the men out of the woods while Everett Allen, a ranger, Bass River, drove the others to safety. It was not until nearly an hour after Allen reached West Creek with his load that it was discovered the other truck was missing. Meanwhile, Ira Morey, terribly burned, managed to get out of the woods and give first news of the tragedy. Morey was taken to Camp Dix hospital, where he died, and rescue crews were sent after the other men. Carr’s body was found in the truck. The bodies of the other three were found 200 to 300 yards from the machine, which is believed to have been wrecked when it struck a tree as Carr lost control in the dense smoke. All of the dead were so horribly burned identification was nearly impossible. They were taken to a Tuckerton morgue, where they lay for more than 12 hours. Lieut. Julius Stark, CCC officer, identified Carr by a mole on his shoulder, and LaSalle through a dental filling. White was identified by inspecting the teeth. Sullivan’s father, Amos, identified his son by a ring and locker keys. Sullivan had been a member of the CCC camp but eight days. A number of men had been reported missing from time to time Monday night. One, Dandall Leek, 24, of West Creek, has been accounted for. Leek was reported missing when his car was left all night on the highway. However, he turned up yesterday, explaining he had left his original group of volunteers and gone out with a second party. He was unharmed. Ten men are in hospitals. In Camp Dix Hospital are Stanley T. Bieselin and Philip J. Matthews, of the New Gretna CCC camp. Bieselin is a son of Carl Bieselin, Mullica township clerk. The other eight injured were taken to the Paul Kimball Hospital, Lakewood. They are: Irving Tinkel, New Brunswick; Christopher Lipton, 528 North Delaware avenue, Atlantic City; Richard Allen, Bordentown; Lewis Hedervary, New Gretna; Melvin MacQueen, Lakewood; William Morey, West Creek; Robert Adams, of New Gretna, and Emil Wauchlin, of Tuckahoe. At the hospital it was said each of them was suffering burns and effects of smoke. Morey, another brother of the fire warden, and Hedervay are in critical condition. Scores were burned less seriously and were treated by roving doctors and ambulance crews who have been running up and down the fire lines continuously. Ambulances from Camp Dix and nearby Ocean county communities were rushed to West Creek and an emergency hospital was established by the Toms River First Aid squad. Recapitulation of the four-day damage revealed: The fires burned over more than 20,000 acres of forests and bog lands in Ocean and Burlington counties. At least nine towns were saved from destruction by the combined forces of more than 2,000 CCC workers, volunteers and soldiers. Twenty-three fire departments aided fire wardens and others in drenching homes and preventing the fires from entering towns. More than a score of homes, camps, gunning clubs and a sawmill were destroyed. Forest rangers were able to count 15 fires – four main ones and 11 smaller ones – at noon yesterday. The most destructive forest fires in several years have been raging in parts of the pines districts of Burlington, Ocean and Atlantic counties during the past few days. Several times the firefighters succeeded in extinguishing the flames, in one section only to have them break out in another. The most menacing fire swept over thousands of acres in the neighborhood of Chatsworth on Saturday and Sunday. It had burned over an area of twelve square miles on Saturday before it was brought under control near Todd’s cranberry bog. In its course the fire swept across the Chatsworth cemetery. Had it not been for a sudden veering of the brisk wind it was probable that the town of Chatsworth would have been at least partially destroyed. On Sunday the flames broke out again in that section and once more bore down on Chatsworth. A force of 400 CCC workers was hurried to the scene from the Lebanon forest, Pack and Bass River camps, while fire companies from Barnegat, Tuckerton and Manahawkin were hurriedly summoned. The firemen from the bay-shore towns were stationed at Chatsworth, Warren’s Grove and Clayton’s Grove. Orders were given by means of radio cars, while district fire warden Peter Crozier and J. Paul Allen directed the efforts of the small army of fire fighters. Besides the CCC workers, the Penn State Forest camp and buildings would doubtless have been destroyed. Additional forces came to their rescue from the Atlantic county mosquito camp. A new fire got under way south of the railroad tracks at New Lisbon on Sunday and burned over a square mile before a force under the direction of sectional fire warden Abraham Brown and Allen Brown, brought it under control. On Saturday, Sunday and Monday, State Fire Warden Leonidas Coyle flew over the burning area in his plane, sending messages by radio to his forces on the ground beneath him, equipped with receiving sets. Some livestock, mostly pigs, perished in the furious flames which swept over the terrain with incredible swiftness at times. The fine hunters’ cabin, owned by Blackwood Gun Club at Leaktown, was destroyed entailing a loss of $2,500. The home of Frank Anderson, at Jones’s Mill, was damaged but not burned down. Several other buildings were in the path of the forest fire and destroyed. A number of cranberry bogs were burned over, entailing a heavy loss to the owners. On Sunday afternoon hundreds of cars, returning from the shore to inland points, were turned back when they attempted to drive through the threatened area on Route 40. From these cars the lurid glare of the fire was visible, and the ominous roar and crackling could be heard. For many it was a novel and somewhat alarming spectacle, and most of the drivers needed no second word of caution to persuade them to turn back and go home by way of Barnegat, Forked River and Whitings. A number of these cars were from Mount Holly and other Burlington inland towns. With the underbrush and dead leaves as dry as tinder and leaping into instant flames when touched by sparks, the woods fires which had been raging for days in the lower end of this county and the adjoining pine woods in Ocean and Atlantic, became even more serious on Monday. The fire in which the men were caught was one of three forest fires that swept across the southern part of Ocean county on Monday and threatened a half-dozen towns on the western Bay Coast Monday night. The main fire, an extension of the conflagration that burned all day on Sunday in western Burlington county, on Monday afternoon cut a four-mile swath eastward across Ocean county, destroying three buildings and a sawmill at Warren Grove. By night it had traveled 16 miles and was attacking Mayetta, on the New York-Atlantic City highway south of Manahawkin. At Mayetta it destroyed one home and set scores of residents to preparations for evacuation. Fire companies from a dozen nearby towns managed to prevent a serious conflagration. A third fire starting to the south of the main body cut a wide track toward Tuckerton, but was brought under control Monday night. Automobiles going south were turned off along a western detour at Manahawkin, while from the south, traffic was diverted along the White Horse pike. Thousands of men labored with spades and with chemicals to stay the onward march of the fire filled areas. In the woods about Warren’s Grove, hunting centre, a saw mill owned by George Cranmer and three deer club lodges were destroyed by the flames. In the village itself two fire companies from Barnegat and Manahawkin stood ready to defend the houses and the residents, their belongings packed in automobiles, awaited word to vacate if it became necessary. Backfires about the outskirts of the town, however, had done their duty, and the fire passed by, burning only one house on the edge, a summer bungalow owned by Charles Holloway. Holloway’s permanent home, across the road, was untouched. The area about Warren’s Grove was burned out and late Monday afternoon the western end of the conflagration was a few miles east of it. Dense black smoke covered the fire area like a pall, extending high into the air so that it was visible for miles around. Hundreds of game animals and birds emerged, frightened, from the suffocating woods, while thousands more were estimated to have perished from heat, flames, and smoke. Deer, rabbits, pheasants, grouse, and quail were seen dashing out. The advance of the fire was believed to have been stopped early on Monday just west of a road bisecting the Tuckerton-Philadelphia and Manahawkin-Philadelphia roads, near Warren’s Grove. Before noon, however, the advancing flames, born by the stiff breezes, managed to jump the back-fired area near the road, and then began their rapid eastward advance. Inhabitants of Manahawkin, which is a trading centre for the Barnegat Bay towns, thronged the streets all afternoon, anxiously watching the advance of the fire, audibly wondering whether they would have to flee their homes. Fire apparatus at Atlantic City stood by ready to come to the assistance of Tuckerton should the blaze resume its aggressiveness and renew the advance on the town of 500 buildings. 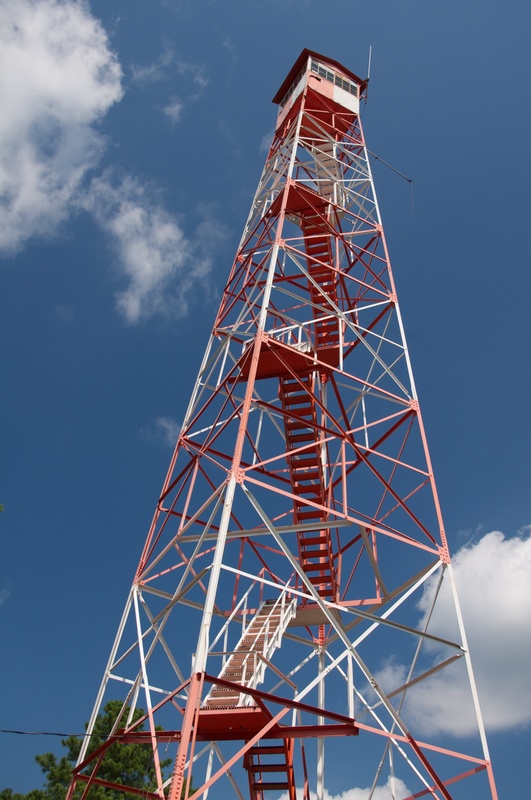 Special measures were taken to protect the Tuckerton wireless station. Originally published by the New Jersey Mirror, May 27, 1936. WATERFORD, N. J., Sept. 15.— A terrific fire is destroying thousands of acres of cedar swamps near here to-night. This is the fire that has been burning in the Jackson meadows for the past two weeks, and which has destroyed at least $60,000 worth of property. A forty-mile-an-hour wind this morning drove the fire into the big cedar swamps and toward the Burnt Hill cranberry bog, a mile from here. Residents, with a big gang of Italians, drove out in wagons and are still fighting the flames. By back-firing from the Atco branch of the Jersey Central Railroad they saved the Collings cranberry bogs, but the fire Is now stretched in the big swamp from Jackson to Atsion, a distance of ten miles. The teams with which the fire fighters drove to the scene came near being burned just before noon, and it was only by galloping through the suffocating smoke that they were saved. Cinders from the fire fell in Cedar Brook, several miles away. It was learned to-night that the house and outbuildings of Isaac Hertford’s place were destroyed, and one Italian from this place has been missing since 5 o’clock. E. Z. Collings, an extensive cranberry grower, is here with a big gang, trying to save his bogs. Food is being conveyed In wagons to the exhausted men, who have been fighting all day. TRENTON, N.J., Sept 16. – New Jersey has just reason to be alarmed about forest fires, for she now has 1,300,000 acres of land remaining in forests in what is known as the pine country, which embraces Salem, Cumberland, Monmouth, Ocean, Atlantic, and Burlington Counties. The wildest part of the Jersey woodland is divided into pine-land tracts. These tracts are as follows: Hominy Hill, 9,000 acres; Manasquan River, 17,000; Metedeconk River, 19,000; North Branch Toms River, 7,000; Toms River, 60,000; Fort River and Rancocas, 80,000; Burlington Plains, 172,000; Atsion River, 63,000; Great Egg Harbor River, 30,000; Maurice River, 26,000 ; Salem Barrens, 3,000, making an area of 346,000. Deducting this from the total area, leaves 1,300,300 acres fit for tillage, of which more than 500,000 acres still remain in forests. The State Geologist has assigned to John Gliford of Mays Landing the task of makthg a special study of the pine country, with a view of devising schemes, not only for the preservation of the forests, but for turning considerable [parts – ED] of the area into tillage land and preventing forest fires. The results of his investigations have been the production of a large amount of useful information and the beginning of an organization especially for the preservation of forests. Mr. Gifford contends that the woodman’s great enemy is the forest fire. He has had during the past few months ample opportunity to study for himself the ravages from this cause, because forest fires have extended well around the pine belt of West Jersey, destroying thousands upon thousands of dollars’ worth of property, and some of the fires would have been raging yet were it not for the recent heavy rains. The damage will go up into the hundreds of thousands of dollars, because not only woodland was destroyed but many of the small stopping points of three or four houses were wiped out of existence. One of the most notable landmarks of South Jersey was consumed ten days ago while the fires were raging in the upper part of Atlantic County. It was Doughty’s Tavern, off from Buena Vesta, which has been for half a century the favorite abiding place of sportsmen in quest of deer, quail, grouse, and pheasant. Cranberry bogs, to the value of $75,000, were destroyed, which bad the effect of making the New Jersey crop exceedingly short and defeating the cranberry growers in their new scheme of making a liberal shipment to England, where last year the cranberry was introduced under favorable circumstances. Mr. Gifford says that what is everybody’s business is nobody’s business, and, in consequence, there is no united action in either the prevention or the fighting of forest fires. When a fire is discovered, a few men come to the rescue of the property owner. Forest fires, he contends, start in the following ways: First, by railroads; second, through malice, and third, by carelessness. There is no doubt that locomotives going through the pine land are responsible for many conflagrations. It became incumbent upon the railroads to use spark arresters on the smokestacks of the engines, and by having places especially prepared for the dumping of hot coals, and also in having each side of the track well plowed. The engineers, however, frequently become careless and remove the spark arrester or dump live coals wherever they please. At the present term of the Atlantic County Court there are a number of suits which are brought by ten prominent land owners of Galloway Township against the Philadelphia and Reading Railroad for fires started by sparks from locomotives, which destroyed great quantities of timber. Much interest is being taken in these suits, because they are test cases. The woods are frequently set on fire by spiteful men, who either have a grudge against the land owner, or burn another man’s property to increase the value of their own. Two of the most destructive fires In South Jersey this Summer were caused by a careless man burning brush, and another man “getting square” with a neighbor by the use of a torch at midnight Tramps and gunners, as well as other persons trespassing in the woods, and especially boys, throw matches carelessly about or drop a lighted cigar stump into dry leaves. The South Jersey Woodmen’s Association is now being organized. Its objects, as declared by the prospectus, are to improve and prçtect the forests of the southern counties of New-Jersey; to prevent all wanton and needless destruction of forests; to adopt such methods of cutting as will increase and prolong the yield of timber and coalwood; to insist upon the enforcement of laws in relation to forests, and the punishment of malicious and careless fire setters; to encourage the planting and growing of valuable trees on Jersey waste land and elsewhere, and, wherever practicable, to encourage such methods of forest management as will tend to preserve and mcrease our water supply and protect the wild animals of the woods. It will also be the purpose of the organization to secure needed legislation. There are now two laws on the statute books. One was passed by the Legislature of 1893. and gives to the Township Committees of third and fourth class counties certain pow- en, this classification embracing all the counties in which the Jersey woodland belt is situated. The law says that the Township Committees have power to employ any person or persons whenever necessary to fight and extinguish fires and to fix a reasonable compensation. This law was never deemed practicable, and, consequently, no townships moved under it. During the last session of the Legislature a genuine forest-fire law was enacted, as a supplement to the old one, ordering the Township Committees to appoint Fire Mars shals, providing for their compensation, and eterm1ning their duties. The following is reprinted from “A History of Monmouth and Ocean County” by Edwin Salter. Fires have been so frequent in the extensive forests of Ocean County, that it is a hopeless task to attempt to enumerate them or describe in detail the exciting scenes they have occasioned. Often thousands of acres are swept over and tens of thousands of dollars’ worth are burned in a very short time. With a high wind, the roar of the fire in the woods, the flames leaping from tree-top to tree-top and running along the dried leaves make an appalling scene never to be forgotten; and the exciting work of fighting fire, with the flames often leaping over their heads or on the ground escaping and surrounding them, is too familiar to our old citizens to need describing. About fifty years ago [around 1840 – ed] a fire broke out in the woods between Oyster Creek and Forked River, and many persons from Waretown and Forked River endeavored to subdue it. A sudden shift and increase of the wind brought the flames down with such rapidity upon the men that they had to run for their lives for the nearest body of water, which happened to be the old Frank Cornelius mill pond on Forked River; but one man named George Collins, of Waretown, missed the right road, and was overtaken by the flames and burned to death. His shoes were left to mark the spot where he was burned, for twenty or thirty years after. “An observant traveler, taking his way through the bleak woods in November, especially, along the tangled and moss-carpeted trails among forgotten towns, must sooner or later acquire something of a philosophic viewpoint. “If he goes down to Retreat, four miles or so out of Vincentown, as we did, he will hear people recall how Charlotte Cushman, one of the most famous actresses of her time, spent Vacations there. “If he presses on to South Park, on the trail that carries through miles and miles of desolation to Chatsworth, he may see a small truck marked “Fire Patrolâ” emblazoned with red diamonds of the Fifth Divisionâ – the carryall of hard-working Albert B. LeDuc, who guards 80,000 acres from forest fires. “Weighing these considerations, the traveler will consider them in relation to the information that no one now remembers how Apple Pie and Bread and Cheese Run got their names, still retained on modern maps; that Retreat once was a thriving little town with four mills and 14 dwellings; that Fire Warden LeDuc remembers his artillery service in World War I and so goes every Memorial Day to decorate the forgotten grave of a colored soldier, and, finally, that nobody recalls much about that cemetery at Eagle except that it was and is consecrated ground. Before I go on with this record of my own, written in 1936, let me say that Albert LeDuc is dead and that what I am writing is his memorial. For much that I learned of the country on and around Apple Pie Hill came long ago from this old and kindly friend who died in the land he loved best, the pinelands he once guarded from fire long before protection became more highly organized by the state. Albert was 74 when he died. He had not been well for many years, almost from the day of his retirement from the forest fire service in 1944. His death was not attributable, however, to the asthmatic plague which, in the beginning, brought his uncle and thus, Albert, himselfâ€”to New Jersey. Albert’s kin, seeking relief from the disease in Death Valley in the 1880s, picked up a copy of the New York World In which, as he told me long ago, there was a full-page advertisement concerning a Jersey town named Paisley. Paisley, as it-was called In days before it became White Horse, was proclaimed as a haven for all asthma sufferers and Albert’s aunt and uncle hurried back east. They arrived in the New Jersey pinelands of Burlington County, discovered that most of the claims about Paisley began and ended in real estate advertising, and remained even though the town’s hopes blossomed and then faded before there was a bloom. I know that there was a Paisley newspaper and I think I have shown you a copy, it was one of those publications Issued as part of the business than went on in New York, offering “indisputable proof” that there was a town, sure enough, with a factory making mattresses of pin needles, a conservatory of music, and much more. Albert LeDuc was a native of Marseilles but he had been a very real American almost from the moment his feet touched American soil. He had been in Burlington County since the early 1900s and I know that if my mother were here she would remember well the night that we joined Albert at a Harvest Home dinner somewhere in the vicinity of Indian Mills, a night when Albert showed his joy in eating. A veteran of World War I, he was an active member of the American Legion, having served as Commander of the Mt. Holly post. It was Albert who led other searchers to the place where Emilio Carranza, the Mexican flier, fell in the Jersey Pines and it was Albert who was a leader in the movement that brought a permanent memorial to the airman deep in the woods beyond Tabernacle. Albert, who evolved the system of fighting forest fires with fire, a plan first used by the Indians which, these long years after, has gained new acclaim, had a secret passion for discovering forgotten graves as well as towns and, as you might suspect, placing flowers where others had passed by. It was Albert LeDuc who made a point of joining other officials in a ceremony at the Carranza monument every year. In the beginning, however, I came upon Albert and his little car almost anywhere far from civilization and we became fast friends. All those years ago it was Albert LeDuc, the man with the quick, erratic gait and the spasmodic way of speaking who took me down a sandy road to a forgotten cellar from which he dug faded real estate brochures of the area telling how Dr. William A. White, a New York physician, was going to build a sanitarium at Pine Crest. Then he found a bottle of “Pine Crest Water” for me, saying it was pumped from the pines and sold as magical in New York. I remember his laugh when he told me that the natives used the water in their car batteries. That was when, although I didn’t realize it, Albert LeDuc of the little red truck was telling New Jersey authorities to burn the woods in Winter, protecting the land the way the Indians did. Albert preferred to remember the legends of Retreat and how Charlotte Cushman used to come down into the woods when she was managing the Walnut Street Theater in Philadelphia. “We went to South Park where Albert LeDuc was waiting for us,” I wrote in that first record of a venture into a land of mystery which always will have its lodestone for me. “Rather, he was putting in his time by sawing wood. His fire district is certainly one of the most extensive and important in the pinelands. However, despite the breadth of his territory and the alert anxiety he must observe for breaking out of fires somewhere in that vast stretch of 80,000 acres, he maintains a cheerful mien and a surprising agility for his 57 years. That, you see, was long ago. “What is more,” I went on, “Albert knows these back trails, lined with brambles and pine and cedar scrub, like a book and so he told us why we missed that cemetery near Eagle on earlier excursions. “Warden LeDuc did not take us to Eagle immediately. Recalling how well the late Warner Hargrove, our first guide, had spoken of him, we were only too glad to listen. “We had been up Apple Pie Hill before, of course, but his companionship made this journey like a first visit. The hill, you see, is the highest point in southern New Jersey, 210 feet above sea level. Albert said that if the woods were cleared and the hill surfaced in packed snow, the impetus given by the slope would carry a bobsled 10 miles. The bill is scarred with sharp ravines and on its top is an emergency fire observation tower. From its lookout platform one can see far across the blue haze of the barrens, 20 miles in any direction. On a clear day the masts of the radio station at Tuckerton are etched against the sky. That was the day Albert told me about Dr. White and, at the same time, showed me his white- painted dwelling in the midst of a cluster of small buildings on the hill, all of which have disappeared. “Down the slope, I wrote then, “is a small bottling house where Dr. White obtained and circulated a health water under a State license, water Albert said was so pure that natives claimed it to be as good as distilled. “The fate of the hospital, called Pine Crest on the labels of the health water bottles, has been uncertain since Dr. White’s death. A key to the place was on Warden LeDue’s large jingling chain but he used it only for those interested in another broken dream of the pine country. From Apple Pie Hill he led the way to Eagle, across the Jersey Central at Sandy Ridge. There is the evidence of one large dwelling here on a surprisingly green rise, shuttered by buttonwoods, trees that do not belong in this area at all. This is the McCaimbridge house, the warden said, and it was built of logs. The McCaimbridges and a family called Wills were the only settlers in the vicinity. The old fences leading down the hill into pine timber that was worth looking at until the fires choked it out stand forlornly askew. Then, where fires have cracked through time and again, Albert LeDuc found the cemetery for us – you’d hardly call it that – even though a wandering priest came and made it hallowed for all time. Headstones and footstones never were stone but pine boards. Today the beavers have eaten all along the ground to leave them standing on mere spindles. The one inscribed stone in the line half covered with the muck of the years gave authenticity to the legends of habitation there: “Charles Wills – 1839. So ended the record of the journey with an old friend who knows more about Charles Wills then he ever could have on [word missing]. Perhaps Albert DeLuc and Uncle Till Estlow who until he died lived in Brookville are comparing notes on Eagle now. For it was later on when something that became ‘Jersey Genesis’ was being put down in scribbled notes that Tilden Estlow took me there. Uncle Till lived in Wells Mills and I have always wondered if the Wills had become Wells in later days. When Godfrey Estlow died an entry in an old diary said that he was buried at “the Barnharts Place and some of us have always concluded that Barnharts was Eagle. I know that when Uncle Till took me to Eagle he said that his grandfather, Christopher Eatlow, lay buried in one of those graves marked by a fire-charred spindle. I must go down along those trails again, at least to pay my respects to Albert’s widow, Maude, known throughout the area as a very real missionary on a frontier that most of New Jersey overlooked. Mrs. LeDuc founded the Oak Grove Presbyterian Church near her home and continued her philanthropies among the people of the area in a way, which to my knowledge, never has been mentioned in Albert’s obituary notice. Albert died at what is known as Johnson Place but Oak Grove is really just up the road. There have been many changes in that pine country beloved by Albert since my first journeys down that way, at the beginning with a bored photographer who thought I was crazy, and later with a night police court reporter who had a car so full of scratches that a hundred more among the brambles of the faraway didn’t matter. Albert’s aunt was living then, in a house not far from the mythical Paisley. The house was burned, I was told the other day, when Albert allowed its sacrifice so that pinewoods firefighters might try out their equipment. How did Palsey get its name? Reaching back for scraps of conversation, I suddenly remembered Albert’s story of his uncle, the Frenchman in search of a hideaway from asthma. “He had a Scotch maid who came from Paisley, he said, “and he named the town to please her. “Who, your uncle? I remember asking. “No, of course not, he said. “It was the real estate man. Paisley was here long before my uncle came although nobody seemed to have done much with it. The mattress factory was just a building and a few people going through the motions. The hotels and conservatory of music pictured in the newspapers were never built although work was expected to start any day. That’s what they always said. By now there are ribbons of concrete across the lands that were hard to come by even in those first journeys of my own. Most of the sand trails we traveled with an ax and a shovel kept handy have added hard surfaces where there were deep ruts. You can go through White Horse and South Park and Retreat at a high rate of speed compared to the snail’s pace of long ago. However, the ways of life that Albert LeDuc showed me up from a rise called Apple Pie Hill and a broken ridge called Chicken Bone are to be found today much as always they were. 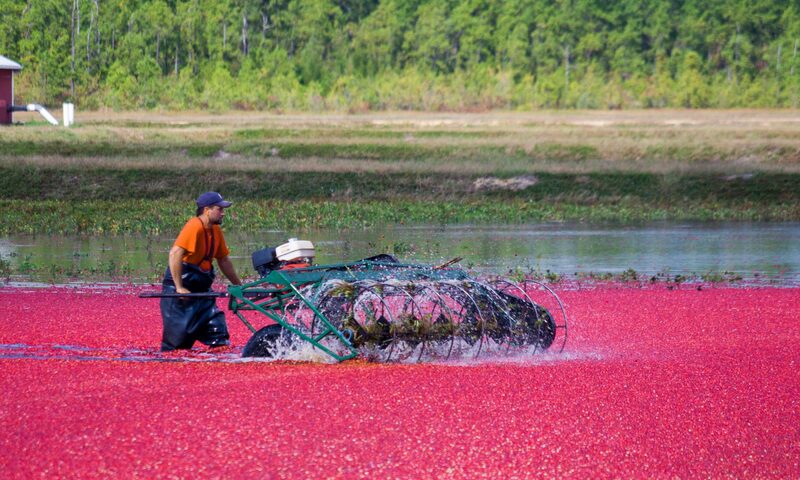 The cranberry men have more bogs than ever but they scoop the berries much as they always did. Go down to Hog Wallow and Haines Bog and Speedwell along the Chatsworth road when the seasons on and you’ll see the scoopers in action. Albert sold much of his uncle’s land to expanding cranberry growers. The old tower on Apple Pie Hill should be, it seems to me, Albert LeDuc’s memorial Having escaped fire after fire, it has been replaced in service by a modern steeple of much impressive height. As for Paisley itself, only one cellar hole remains to prove it was ever there; a lone cellar hole and an apple tree, still bearing in the remnants of an orchard. I want you to remember Albert LeDuc even if some of the firefighting experts of a new day choose to forget him. I want you to recall him not because he was my friend but because, through his kindly recollections, you have some knowledge of a never-never land in which anything can happen and often does. Whenever I go back to the Pinelands, as I like to do often, things in general get a little [word missing] tight for comfort. I don’t think I will miss the pioneer warden of the forest for his spirit, somehow will still be there.